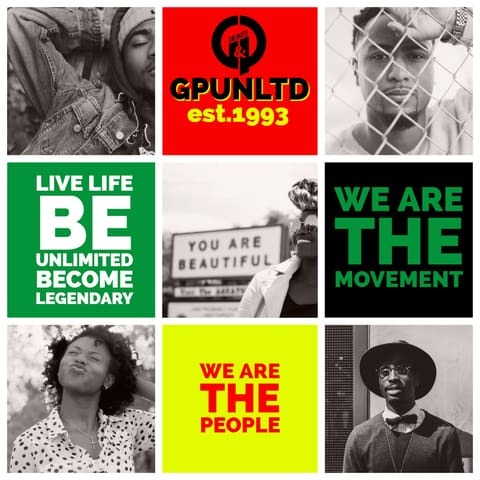 G & P Unlimited Co. is a premier Streetwear, Outfitters, and Lifestyle Company. Our focus is on empowering people to live an Unlimited life by cultivating a grind mentality, a hustle culture, and purpose perspective. We create and distribute G & P Unlimited Co. branded products and services. We take pride in knowing that we are different from other streetwear companies because we are promoting a culture, not just clothing. We are a catalyst that awakens people and to live an Unlimited Life. We exist to aggrandize a grind mentality, a hustle culture, and purpose perspective. To be the pioneer of the unlimited lifestyle and leaders in hustle culture and urban consciousness. To inspire and motivate people to be great in their individual work, worship, and service. We do it for the Culture! We Hustle and Grind for the People! We are committed to being active community citizens. Our hallmark work is PoEthics – servant leadership to humanity, outstanding ethical conduct and resolute responsibility to our communities. We believe that service must be entrenched within our ethos, and translated in our company’s culture, to ensure that we are creating an environment that inspires people both customers and employees to Live Boldly, to Live Authentically and to Live Unlimited. Our supporters are activist, artist, blipsters, clergy, civic leaders, educators, entrepreneurs, hipsters, innovators and minimalist who live a life of service to humanity (PoEthics), but also grind and hustle to make their dreams become reality. Unlike our competitors, we are not selling scriptures on shirts. We are a fashion and culture. We don’t just wear the lifestyle, we live the culture. We are inspiring supporters to live holistic lives. Our blog and products are centered around help you to be inspired, motivated, and educated to thrive so when you are in the middle of the hustle and grind of life you are performing at your peak.